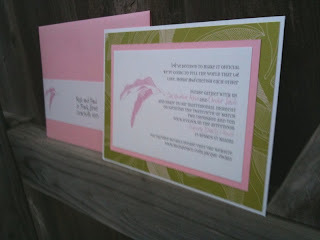 We were thrilled to create these wedding invitations for our lovely bride Jacqueline in Australia. She is our was our very first aussie bride, however, we know have several of them on the books. 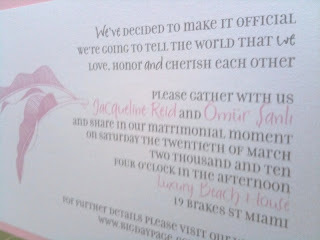 Jacqueline's invitations shipped this past weekend, but we couldn't help to share them with you. 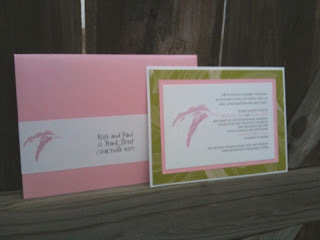 She chose the Cute Beach House Wedding Invitation design and just made a few slight adjustments to it. First, we changed the dark Rubelite pink color to a sweet light pink color called Tourmaline. 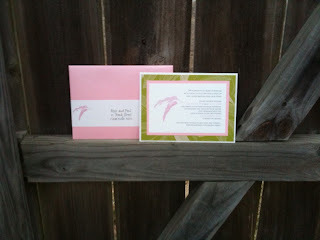 We also did away with the pocket & added white wrap labels on the outer envelopes which we addressed with her guests' addresses. This all made for a very cute piece. Those are sooo pretty, Great job!